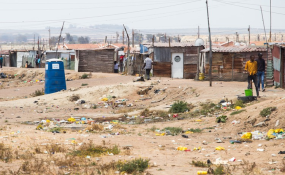 Residents of the Tsitsiratsisi informal settlement in Vredenburg, 135km north of Cape Town on the West Coast, might benefit from a long delayed housing project. More than 500 homes are to be completed in Vredenburg by the end of February. The Saldanha Bay Municipality hopes this will alleviate the small West Coast town's backlog. Protests last year about the lack of houses brought Vredenburg to a standstill. The George Kerridge 512 Housing Project was meant to be completed by the end of October 2018. The project is expected to house 1,024 families. "The plots will be divided to allow two families per plot, with communal taps within a distance of 200 metres," said Ethne Julius, spokesperson for the municipality. She said communal flush toilets would be installed around the development, with street lights and gravel roads. Julius said the municipality is also finishing several other housing projects. 28 houses will be built in Diazville's Ndfikile housing project, and the municipality also intends to upgrade Middelpos's Marikana informal settlement. In November 2018, after delays in the housing project, hundreds of people, for days on end, blocked the streets with burning tyres and rubble, preventing vehicles from entering or leaving. The unrest spread to the neighbouring town of Saldanha Bay, 20km away, where residents accused the municipality of sidelining poor people. In Diazville residents also complained of a lack of housing; and high water and electricity tariffs. Several buildings were torched and shops looted during the week-long protests, resulting in damages estimated at R10 million, Julius said. At least 40 people were arrested. Western Cape police spokesperson Captain Hein Hendricks said, "Police are still investigating cases related to incitement to commit public violence; public violence; possession of a dangerous weapon; malicious damage to property; and unlawfully and intentionally setting fire to immovable property belonging to another." Julius said that since November the South African Human Rights Commission has been mediating discussions between municipal officials and residents. "The municipal manager has also met with community leaders to discuss their demands in detail. Urgent attention is being given to these issues," she said.